Who is using sod in the winter months? Sod is used by large construction firms that build bioswales and settling basins where the bio-swales need to be operational very soon and there is too much risk in allowing seed to germinate and grow. Below is a video showing the bioswale using sod (not our contractor) so you can see the application. The cold and rainy season is here in the Pacific Northwest. Now is the time to prepare your lawn for winter. These are the steps that you should be following. Mow your lawn at regular height until the growth stops. The growth slowdown has already occurred for many lawns. Apply lime and a winter type fertilizer. This will slowly be absorbed by the grass roots and prepare your lawn for spring growth. Winterize lawn equipment by changing the oil and emptying the fuel tank. Place into storage. 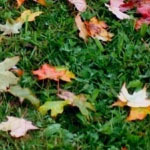 Remove leaves: Keep your lawn free of leaves so they don’t smother it over the winter. Then you are ready to enjoy a warm fire and a good book as you wait for the coming of spring. When Should You Dethatch Your Lawn? 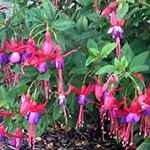 Winter hardy Fuchsias not only grow, but thrive in the Portland – Vancouver, WA area. They need sun, with full sun being best. Plant them in a well-drained location. Sandy soils with added organic material work well. The best time to plant is in the spring of the year, but planting can be done through the summer and into early fall. Winter care of cold hardy (winter hardy) Fuchsias: Allow the frost to kill all of the leaves and trim back the all the non-woody growth. In the spring when green shoots appear, prune the plant back hard and work into the soil a general fertilizer. Fertilize again in August. This is a graceful looking ornamental grass that is a member of the Hakonechloa family. Its bright colors and textures light up the garden. Japanese forest grass does best in full shad or partial shade. It is slow growing and takes little care once it is established. 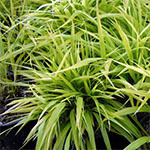 Japanese forest grass is available in striped (variegated) or solid and comes in several colors. Colors include Gold or Green with white or gold stripes. Their elegant textures add character to your garden. It typically grows 18-24 inches high with its blades forming arches that flow back down to the ground. Soil should be well draining and kept moist. Add soil amendments for best growing conditions. Grows well in partial shade. Combines well with Hastas in the garden. Older plants can be dug up and divided to form new bunches. This dividing is best done in the spring or fall. Remove the dead leaves in early spring before the new growth forms. What Causes Light and Dark Patches on My Lawn?? Fall is here and winter will be soon. Winter is the season when you spend the least amount of time thinking about your lawn. There are steps you need to take in late fall to make sure your lawn is vibrant and healthy for next spring. Leaf clean-up: Carefully remove the blanket of leaves that will fall in the next 2 months. 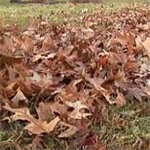 A covering of leaves if left over the winter will smother and severely weaken your lawn. Remove any objects or equipment that can block sunlight over the coming long rainy season. Final Fertilization: In late fall (usually November in the Pacific Northwest) feed your lawn with a good winter type fertilizer. Much like many animals that will bulk up for the winter, lawns will accumulate the fertilizer in its roots to make ready for a spring emergence. When spring does come, your lawn will emerge from its winter slumber with healthy and lush new growth. Tips from Far West Turf Farm and Nursery serving Vancouver, WA and Portland, Oregon. Your Vancouver, WA turf farm. What Happens When You Over Fertilize Your Lawn?